Peggy Ann Hansen passed away on January 7, 2019 at the age of 87. Peggy was my predecessor and the first archivist for the Diocese of Olympia. It is because of Peggy and her passion for history and the documentary heritage of the Church, that the Diocese of Olympia Archives exists today! Peggy was born on October 24, 1931 in Balboa, Panama (Canal Zone) to Arthur M. and Louise J. (Walters) Veney. A graduate of Balboa High School , Peggy went on to West Virginia State Collee and received certification in Dental Hygiene and later, from the University of Washington where she took courses in Archives. Peggy married Walter J. Hansen on April 10, 1953 in Palm Beach, FL. She worked as a dental hygienist until marrying Walter. She later volunteered her time as a librarian for the Diocese of Olympia’s Department of Education – overseeing the Church by Mail program, sending out materials to families in rural and isolated areas of the diocese. While in this position Peggy also published The Lamplighter, the monthly publication of the Pacific Northwest Association of Church Libraries, receiving an award for this work in 1976. Although her college training was in dental hygiene, her interest in history and skill in record keeping moved her to begin a process of preserving the records of the diocese and the important papers of former bishops. In 1976 she was instrumental in establishing the diocesan archives and became the first archivist for the Diocese of Olympia. 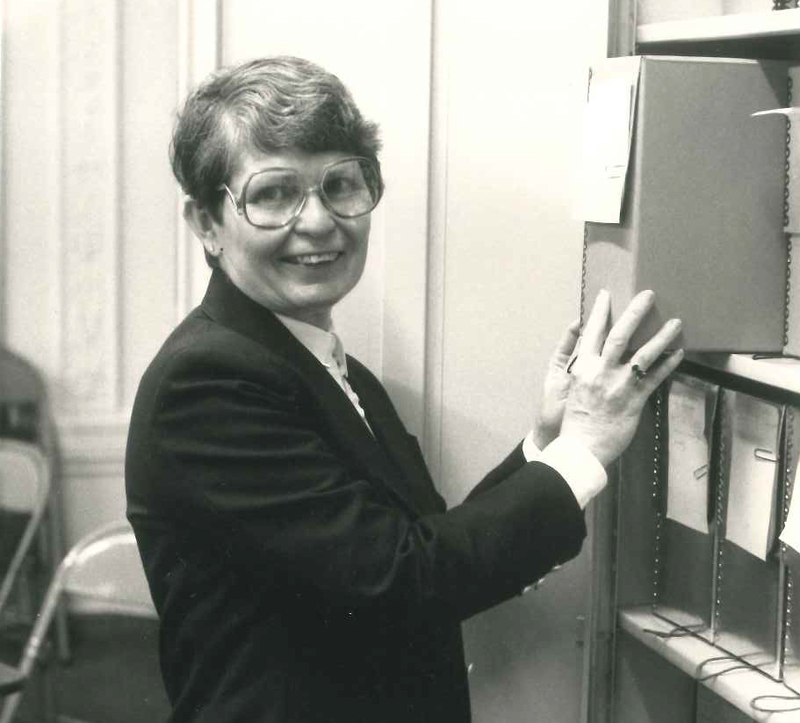 Peggy held this position for 18 years, during which time she built a professional archives of which the diocese can be proud while also instituting a records management program which, in essence, is still in place today. Peggy was an active member of the National Episcopal Historians and Archivists, a member of the Episcopal Women’s History Project, and was well known throughout the archival community for her work at the diocese. In the mid-1980s she collaborated with the Rev. Dr. Charles F. Schreiner on his book entitled, A History of the Bishops of the Diocese of Olympiaand also headed The Centennial Project Committee which published the book, More than 100 Years of Ministry: The Episcopal Church in Western Washington as a contribution to the celebration of the 100thanniversary of Washington Statehood in 1989. When Peggy retired in 1994, she addressed the diocesan convention and closed her remarks with her personal philosophy about archives: I have been asked many times over the years, what does archives, and records management have to do with the Church? Why should we fund an archivist or records manager?’ Her response was: Your archives saves and preserves the records of God’s people in the Diocese of Olympia. When records are studied and used to write history or answer questions, they tell us how God has acted in our lives and the lives of the communities in which we live. Peggy was passionate about preserving the records of the Diocese of Olympia and its congregations. She offered her expertise to our congregations by holding workshops and consulting on archives and records management topics. She was also passionate about Diocesan House – the former Leary Mansion where the office of the Bishop and his staff – as well as the Archives – are located. She knew the history of the House and shared that history with individuals and tour groups – making Diocesan House a warm and welcoming place for visitors. In 1985 Peggy was awarded the Bishop’s Cross by Bishop Robert H. Cochrane in recognition of her many years of service to the Church in the Diocese of Olympia. Peggy was my friend and colleague. Whenever I had a question about the archives or the diocese, I could always count on her to help me out. During my first year as Archivist, she introduced me to members of the archival community – many of whom I still work with today. I will always be grateful to Peggy for her help and support. I miss her – and I’m sure that those of you who knew her – will miss her too. This is a wonderful tribute Diane. May Peggy rest in peace. Your own ministry as her successor has taken the archives to another wonderful level. And your presentations in the Diocese of Olympia have enabled us to value our past and those who paved the way. At the same time you assist us in embellishing and recording our present as we look to the future. Love from your college and Fan! !